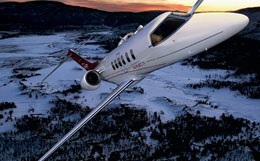 The Learjet 70 is based on the Learjet 40 and will have an improved range because of new Honeywell engines, and upgraded winglets, providing it with a 2000+nm range over the 40s pervious 1700nm cut off. The design for the Learjet 70 comes from several sources; the concept for the airframe design was derived from the Learjet 40 and 45 models while the canted winglet design comes from the Bombardier Global 7000 and 8000 models. The Learjet 70 received Federal Aviation Administration (FAA) certification in November of 2013. 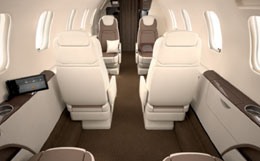 Amenities incorporated in the design of the Learjet 70 include a larger galley, an executive table top, pop up monitors, and a private full lavatory. 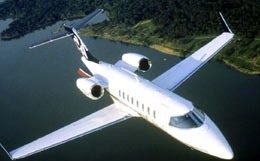 The cabin of the Learjet 70 is typically configured to seat six passengers, but a seventh passenger may be accommodated with seating provided by a belted lavatory. The seating is typically arranged in a forward-club formation, consisting of six seats with integrated built-in storage available in the cabin. The cabin of the Learjet 70 measures 17.67 feet in length, reaches 4.92 feet in height and stretches a maximum of 5.08 feet in width. This private business jet features 65 cubic feet of baggage storage. For passenger convenience, 15 cubic feet of storage is accessible in flight. The pressurization system found on the Learjet 70 is capable of providing a sea level cabin altitude at an altitude of 25,700 feet and is capable of providing a maximum 8,000-foot cabin altitude at its maximum certificated service ceiling of 51,000 feet. 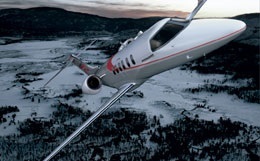 The Learjet 70 comes equipped with two Honeywell TFE731-40BR engines. Each engine is rated at 3,850 pounds of thrust at takeoff. At an airport with a sea level elevation, the Learjet 70 requires only 4,440 feet of runway to take off on a standard day at maximum takeoff weight. With four passengers and at maximum landing weight, the Learjet 70 needs just 2,660 feet of runway to land at sea level on a standard day. The Learjet 70 features an initial cruising altitude of 45,000 feet, which it can reach at maximum takeoff weight, and a maximum certificated altitude of 51,000 feet. 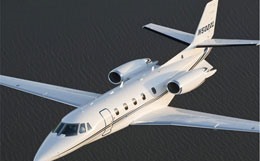 This private business jet is capable of maintaining a high-speed cruise airspeed of 465 knots. 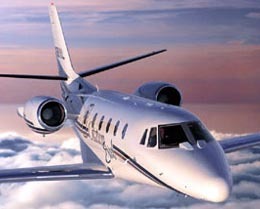 The avionics system selected for the Learjet 70 is the Garmin G5000 integrated avionics suite. Three fourteen inch touchscreen high resolution displays are utilized in this system to display pertinent flight information. The flight deck of the Learjet 70 features paperless capabilities as important checklists, charts, and other required and important documents can be downloaded and shown on the display screens. Instrumentation incorporated in this avionics suite include dual flight management systems (FMSs), traffic collision and avoidance system II (TCAS II), a digital audio system, a solid state weather radar, and Dual WAAS GPS with LPV and RNP approach capability. Also incorporated in the design of the flight deck of the Learjet 70 is the Bombardier Vision synthetic vision system (SVS). This system allows for VFR-standard visibility in IFR situations, allowing for increased pilot situational awareness and enhanced safety both in the air and on the ground. For more information about chartering, leasing or buying a Learjet 70 please contact us by calling +44-20-3874-8091 or send us an email here.